West Coast crabbers and faculty with Oregon State University and Sea Grant programs in Oregon and Washington have been exploring ways to reduce injuries at sea. The effort is part of the Fishermen Led Injury Prevention Program, which was funded by the National Institute for Occupational Safety and Health. “The ideas are generated by the fishermen, and the goal is that the solutions are voluntarily embraced and are not imposed,” says Laurel Kincl, the leader of the project and an assistant professor of environmental and occupational health at OSU’s College of Public Health and Human Sciences. To gather the suggestions as well as build rapport with the fishermen, nine community members with ties to the fishing industry were contracted, including several fishermen’s wives. Laurel and others then trained them to conduct outreach, engagement and research. As part of the project, in the fall of 2015, the nine community members surveyed 365 crabbers in Washington, Oregon and California about the types and number of injuries they may have experienced during the 2014-15 crabbing season. The crabbers reported 65 injuries, 36 of which required them to take time off work or change how they worked. Of those 36, sprains and strains were the most frequent, with 13 incidents. Out of the 36 injuries, hands, arms and shoulders were the most commonly injured body parts, with 17 reports. Nine of the 36 injuries occurred while handling gear on deck, and seven happened while hauling in gear. When asked what they thought contributed most to injuries, fishermen gave answers that included not paying attention, weather and sea conditions, inexperience, unsafe vessels or gear, a lack of training, and poor physical shape. When asked what they thought was the most important thing for staying safe, responses included having a good captain and crew, being aware, taking care of oneself, avoiding fatigue and having a well-maintained boat and gear. Fishermen suggested the need for a fishing-specific first aid and CPR course. As a result, a wilderness medicine expert was invited to the Oregon towns of Newport and Astoria in the fall of 2016 to train fishermen on how to treat medical conditions and at-sea injuries such as cuts, broken bones, dislocated shoulders and hypothermia. Another fisherman suggested looking at the design of banger bars, which are metal bars that are welded to the tables where crabs are sorted. 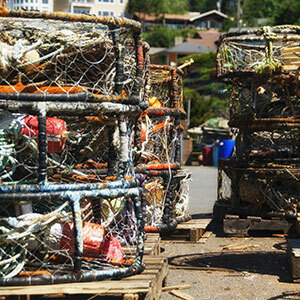 Crab pots are hoisted over and slammed against the bars to force the crabs onto the table. The research team is considering using fishermen-focused Facebook pages, like the Oregon Sea Grant Fisheries Extension Facebook page, to ask for information about the use, design and benefits of the bars. With this information, she says, Sea Grant could create a publication on what a banger bar is and why fishermen use them. It could also include photos or schematics of designs that work better. Also because of fishermen’s feedback, Kaety and the nine community members will interview experienced deckhands and boat captains about what makes a good crew, how to size up a boat to see if it’s safe, and what safety-related language fishermen should look for when signing a contract to become a crew member. Kaety and her team plan to share this information with novice or aspiring crew members. “We’ll put these findings in an infographic or factsheet that we’ll post on social media or mail out so that fishermen looking for work can have that resource,” she says. During the 2015–16 season, fishermen in Oregon landed just over 14 million pounds of Dungeness crab, which they sold for a record $51 million, according to the Oregon Department of Fish and Wildlife. Dubbed the official state crustacean, Dungeness crabs make up the most valuable single-species commercial fishery in Oregon.